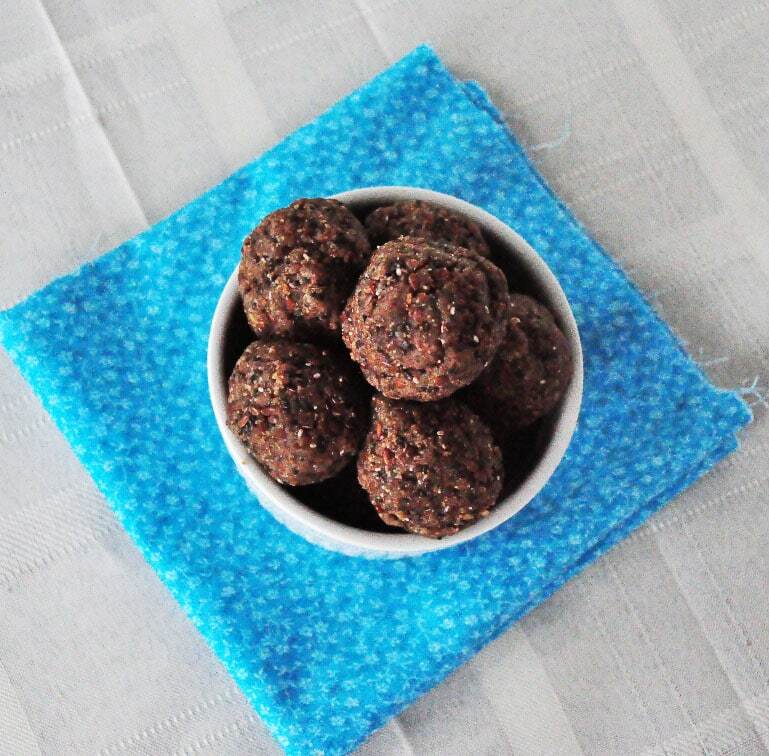 High Protein Energy Bites that are vegan, gluten free and grain free. If you have ever made your own nut milk, you know that you are left with a pulp after that almonds have been milked. I am always looking for ways to use it up. I came up with some Grain Free Energy Bites in the past. 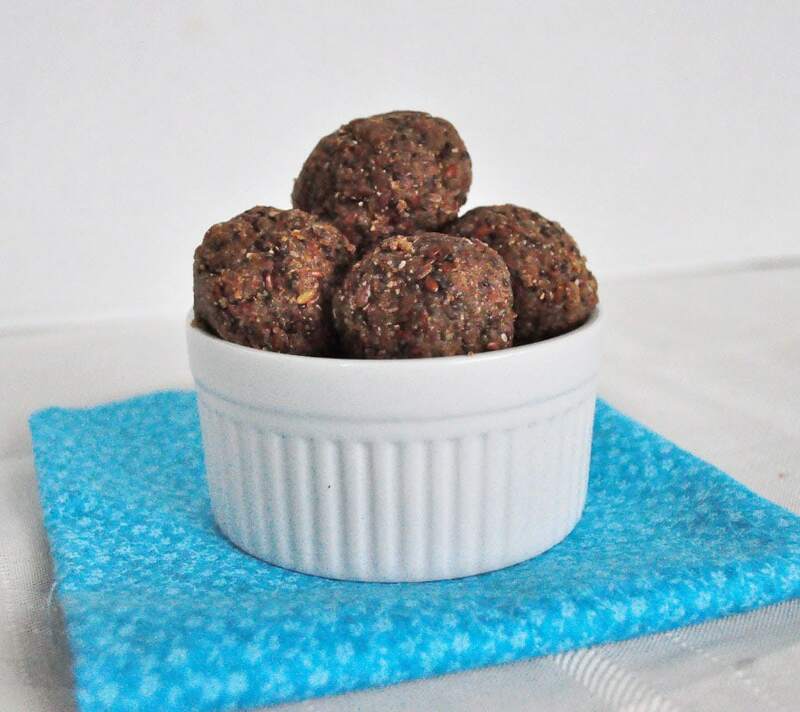 Here is another high protein energy bite that is also grain free. If you are looking to get more chia seeds in your diet, this would be one way to do it. These little bites are low in sugar and packed with good protein and also fiber. They should keep you full for a while. These would be good before or after a workout. Looking for more energy bite recipes? In a food processor, mix everything together until a dough starts to form. Roll into balls carefully. The dough doesn’t hold together very well when rolling but will firm back up in the fridge. Chill in the fridge for about 1 hour to get them nice and firm. I got about 10 balls in my batch. They should last a couple weeks in the fridge. These sound so good and I have all ingredients in my pantry. Could Agave Nectar be substituted for the Maple Syrup? I also have Pure Maple Syrup on hand, but it can overwhelm other flavors. Thanks for sharing these great recipes! Either one would work great! I was wondering about the flax seeds. I see in a few articles we cant digest them the way they are as a whole seed can we use ground instead like the milled kind? You probably could use ground flax seed. I have not heard that before. That's definitely true.....not sure why they even sell them whole. Thanks for the link. I will do that from now on. They sell them whole b/c once they are ground they have a much shorter shelf life, especially if not stored properly. You can keep it in the freezer once it is ground, or if you buy them ground, store them in the freezer. This looks amazing! I have been struggling with how to use my leftover almond pulp for months. Cannot wait to try this out. I made almond milk for the first time last week. So, can the pulp be used in place of the almond meal? Or, do I have to make almond meal from the pulp?? Yes as long as it's been dried out. A rough calculation came out to 144 calories a piece. Hi, just curious if the coconut oil should be melted before adding to the mixture? thanks! Yes. Measure when it's melted. thank you i just saw this reply! Whoops, I've been measuring the coconut oil before I melt it. I guess things have still been turning out good! Is there anything that can be used to substitute Almond Meal ? Ive never made my own milk so I do not have any meal. You can use some ground up rolled oats! so any idea how much protein is in high protein energy bites? they look great. I am not a nutritionist, but I have figured them to be about 5 grams in each little ball. Looks look so good and I finally got the ingredients but I bought Almond Flour instead because I didn't look at the recipe. Will it work? Also I don't have any coconut oil and I don't have a health food store nearby. Can I use any other kind of oil? I think it should work. You can use another light oil if you like. Maybe grapeseed? Please let me know how they turn out that way. I just made these for the first time and had to make a 2nd batch immediately after because I knew they wouldn't last! I used peanut butter instead of almond butter (didn't have any on hand) and measured the coconut oil before it was melted, used ground flax seed and they still came out great. On the second batch I also added about a tablespoon of unsweetened cocoa--oh, so good! Thank you for the great recipe! I used leftover pulp from making milk, but almond meal/flour would work well too. Made these yesterday - so delicious! I had peanut butter and agave syrup so I subbed those in. I thought I would need to roll them in additional almond flour since they're pretty soft at first, but as you said, they firm up in the fridge. Thank you! Is it a must to dry up the almond pulp? Can i just dump it with the rest of the ingredients and roll it into a ball? I haven't tried doing it that way, so I don't know. If you try it, please let me know if it works out. Is there anything I could sub for the coconut oil? We try to avoid all oils. You might be able to add some extra almond butter? Just wondering how to make my own almond meal. I don't have any in the house but I have raw almonds. I am not sure who you make almond meal. If you grind up almonds, you will get almond butter.